← Sea Bunny #2 on 2/22! Please still be my friend after seeing this!! Ha, ha! I personally think it is a hideous attempt at a human skull, but hey, gotta start somewhere…sometime. 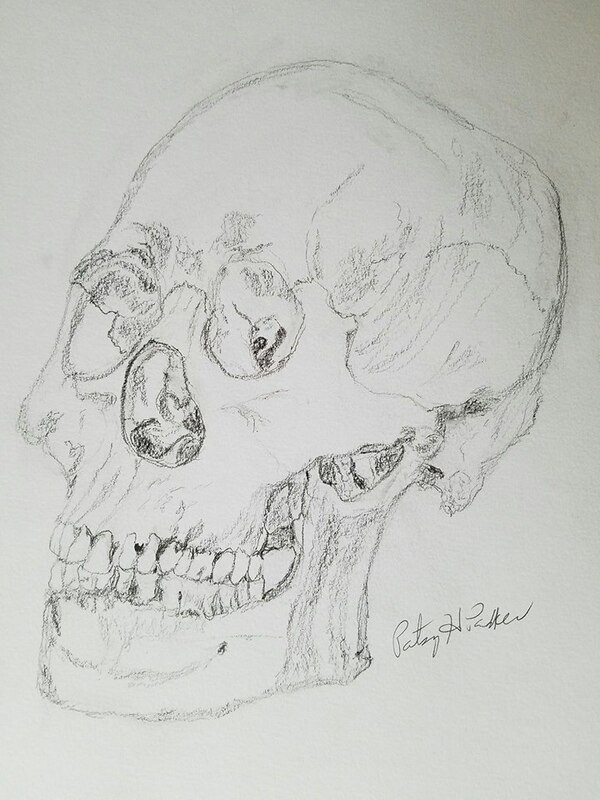 I was looking at a photo I found when I Googled “human skull” while drawing this so I didn’t trace the outline which is probably why it is a little out of proportion. Just as a caution, don’t Google “human skull” if you aren’t prepared to see some shocking ones! Or if you like that sort of thing…go for it! Of course every human’s skull is shaped differently; otherwise we wouldn’t have such a variety of really great people on the planet! They are interesting to look at…go on, you know you want to…. Well, I will be practicing some more but may trace the outline at least so the rest of the proportions are right next time! I have never been one to really like drawing people much, but the skeleton is interesting! Posted on February 23, 2017, in Art Talk and tagged human skull #2, pencil drawing, sea turtle skull. Bookmark the permalink. 3 Comments.